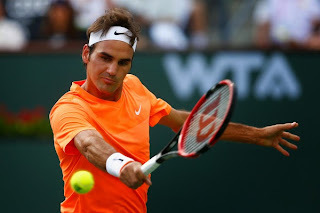 Roger Federer beat Diego Schwartzman 6-4, 6-2 to advance to the BNP Paribas Open third round. Roger hit eight aces, won 13 of 14 points at the net, and faced no break points in the 63-minute match. The former world number 1 will face Andreas Seppi, who defeated Victor Hanescu 6-4, 6-4. The Italian beat Federer at the Australian Open and the Swiss is expecting this revenge. “I'm happy to play him again,” Federer said of his next opponent. “I was very disappointed with the performance I had in Australia. I know he can play well and can beat me, that's not the problem. It was the way I was hitting the ball. I wasn't playing very committed. I wasn't sure exactly how I was going to hit my forehand and backhands. It was just a tough match overall and the match slipped away from me. The champion in 2004 (d. Henman), '05 (d. Hewitt), '06 (d. Blake) and '12 (d. Isner), is just two victories shy of 50 match wins in the California desert.